Our Mother’s Day message is one of the easiest crafts you’ll ever make and Mom’s going to love it! 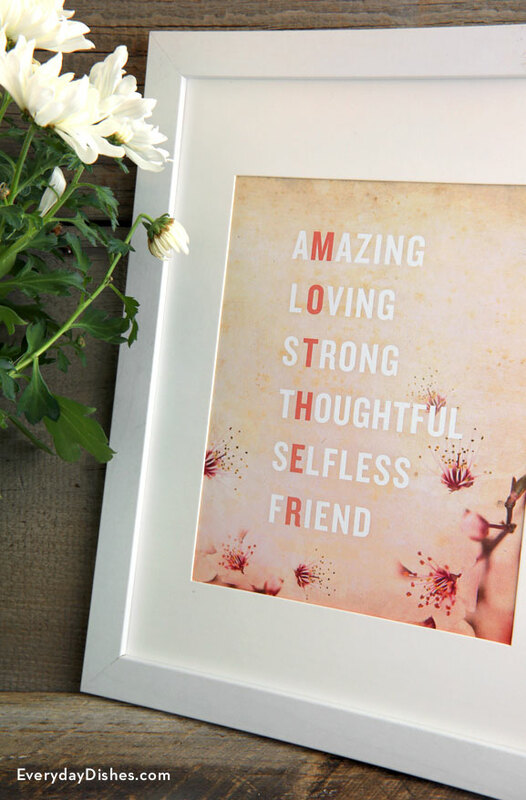 Our printable has an original, subtle design with words to describe Mom, such as ‘amazing,’ ‘thoughtful,’ and ‘friend.’ She will love displaying it to let everyone know how much she is appreciated. Key letters in these sentiments spell out ‘Mother’ at the same time, a grammatical term known as an acrostic (we knew there was a word didn’t know what it was). Our printable fits an 8″ x 10″ opening but you can adjust your printer’s settings to size it to fit your particular frame. If using a larger frame, add a mat and tape the printable to it to keep it securely in place. Download the Mother’s Day message printable and open in Adobe Reader. Remove backing from picture frame and insert printable. If using a mat, be sure to tape the printable firmly in place. Reassemble frame, clean the glass then wrap it up for Mom. If you’d rather choose your own words, just use our printable as a guide then print out your sentiments on your choice of scrapbook paper. Easy!